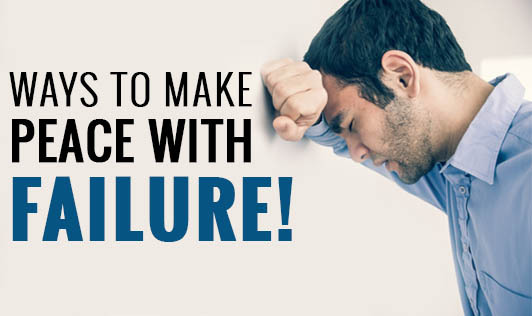 Ways to make peace with failure! We all make mistakes. Even the most brilliant businessmen or talented athlete doesn't get everything right. So, what makes you think you should? The key is to learn how to turn today's failure into tomorrow's triumph. Feeling awful after failing is inevitable and we're humans after all. However, it's how we handle those feelings that are essential to our future achievement and happiness. Accept failure as a part of life: Even when we try to protect ourselves from the possibility of failure and live safe lives, failure can still find its way to us. Hence, sometimes bad things happen in spite of our best efforts. Just accepting the fact can bring some peace. Failure strengthens character: When one fails, he or she learns to do things differently. Hence, take it as an opportunity to grow and build your emotional maturity and intelligence. Failure gives you the courage to try: Embrace failure as a stepping stone leading you out of mediocrity. Remember, it's just one stone on the path. Failure teaches you something: You will learn a better way to deal with situations, have a different direction as well as a new perspective on things. Real friends emerge during failure: When you've lost your job, your marriage is falling apart or you have a drinking problem, You'll see how your friends scatter like startled insects. Except for your real friends, the ones who just love you for what you are, are the ones who will stay. "Remember that like death, taxes and failure is going to happen to everyone at some point in their life. It may be quite hard at first to acknowledge it as just another unbiased life experience. However, by changing your perspective, failure can be an experience that has a lot to offer, leading you to personal growth and eventual success!"